Found on one in every thousand birch trees is a dark-growing mass called a chaga mushroom. Although not pretty in appearance, chaga has been revered in countless cultures for millennia, especially by the native people of Siberia, who called it the “Mushroom of Immortality”. Known as one of the most potent of natural medicines, chaga was given such names as “King of Plants” and “Diamond of the Forest”. Throughout Asia, chaga had a reputation as a natural remedy to promote longevity and good health. With today’s modern research methods, studies into chaga’s true abilities show that chaga does indeed have medicinal potential, benefitting digestion, immunity, and even showing promising results against cancer. These health benefits and more are conveniently available through an infusion of chaga tea. Chaga, like most mushrooms, is known to be incredibly nutritious, rich in vitamins, minerals, and an abundance of active nutrients. Chaga tea can provide protein, fiber, copper, calcium, manganese, vitamin D and vitamin B5, merely to name a few of its many nutrients. It is also a significant source of antioxidants, known to be one of the strongest of all antioxidant foods. Its most significant constituent, however, is betulin, a compound the mushroom absorbs from the birch trees on which it grows. Betulin and its derivative, betulinic acid, have shown an impressive amount of effects, protecting the liver, supporting the immune system and even demonstrating anti-cancer effects. Drinking chaga tea is an excellent way to keep your immune system in good shape. A number of chaga’s constituents offer antibacterial, antiseptic and potentially even antiviral effects, which assists the immune system in the elimination of damaging pathogens. Chaga has even shown effectiveness against parasitic worms. Chaga tea is also beneficial for boosting the immune system’s defenses with its polysaccharides, which stimulate the production of white blood cells. The betulinic acid also helps to regulate the immune response through its anti-inflammatory and fever-reducing effects. While studies are still in early stages, chaga has shown a number of positive effects for those suffering from cancer. The betulinic acid in chaga has been found to cause the death of cancer cells, although it is not yet known how this is accomplished. Chaga’s immune-boosting effects are also important, as they help the immune system to detect and defend against cancer cells. Chaga may also help those undergoing cancer treatment, as it can not only help to protect the liver against toxins, but may ease some of the unpleasant side effects caused by these treatments, such as nausea and weakening of the immune system. Preparation: Preparing chaga tea is a simple process. Add one tea bag to a hot cup of water and allow the tea to steep for a period of 8-12 minutes, or 10-15 minutes for a stronger tea. Chaga tea offers a pleasant, natural earthy taste that many find enjoyable, and is rarely bitter unless oversteeped. Honey or sugar also make an excellent complement to the flavor for those who prefer something sweeter, and lemon may add a refreshing citrus zest. Chaga tea is considered very mild, and currently there are no negative side effects known for this herbal brew. Nevertheless, it is recommended that women who are pregnant or nursing, as well as individuals on prescribed medication, consult with their doctor before drinking chaga tea regularly. Many researchers and herbal specialists believe that we know only a fraction of chaga’s true healing potential, and that continued studies will reveal even more about this remarkable mushroom. Whatever the case, the ancient uses of chaga tea seem to be just as viable today as they were thousands of years ago. Whatever your reason, there is much to be gained from adding chaga tea to your daily lifestyle. When seeking to buy chaga tea, finding a high quality, reliable source is exceptionally important. Chaga is an unusual mushroom in that is rarely successfully cultivated, and only offers most of its beneficial nutrients when harvested from the wild. For this reason, it is essential to seek out wildcrafted chaga tea harvested from a sustainable source. 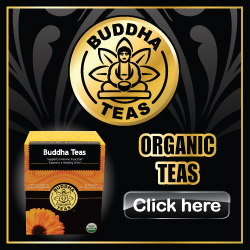 We highly recommend you consider making your purchase from Buddha Teas. This high quality tea company offers chaga tea that is always wildcraft and freshly ground to preserve the most possible of its natural benefits. All of their teas are also prepared in bleach-free tea bags, and are never diluted with any kind of chemicals or additives. Their 100% recycled boxes are also environmentally friendly. You can feel confident knowing that every box of Buddha Teas chaga tea you receive provides you with nothing but the purest, most natural chaga tea you can find. We hope you find this article to be greatly informative. Please don’t hesitate to contact us with any further questions you may have.